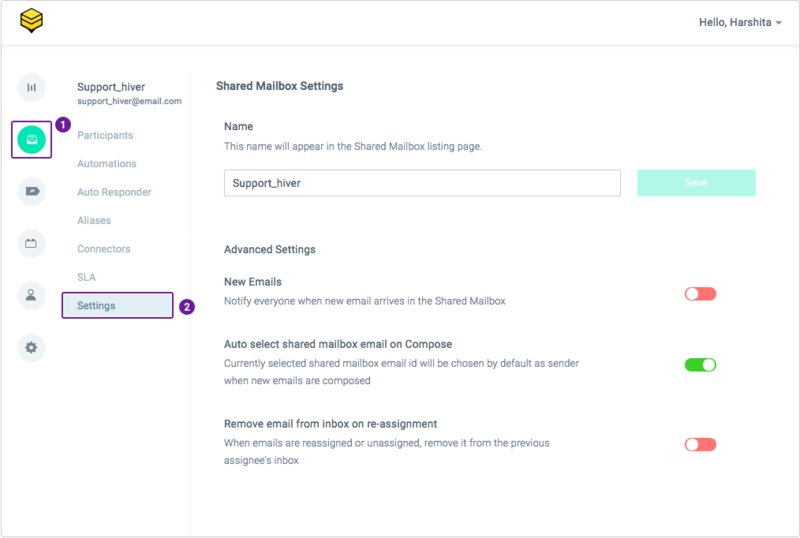 For every Shared Mailbox, you can customize certain options which are then applicable for every user of the Shared Mailbox. Click on the 'Settings' tab to see the Settings options. New Email Notifications: You can use this option to control whether or not all users of the Shared Mailbox will receive a notification whenever a new email arrives in the Unassigned section of the Shared Mailbox. Auto select Shared Mailbox email id on Compose: You can use this option to control whether you want the Shared Mailbox email id to be chosen as the default sender id when any user composes a new email. Remove email from Inbox on Reassignment: When an email is assigned to a user, the email gets copied in her Inbox. This option lets you control whether or not you want the email to be removed from her Inbox when the email gets unassigned or reassigned to someone else.